Probably fine. 7 health minions always intrigue me. The Primordial Drake of the set. 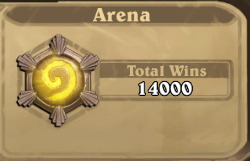 I think this is entirely dependent on the meta if this sees play or not. It reminds me of that grand tournament dragon. That dragon was a legendary, I think it was a 6/6 so more aggressive, but in the end it was a taunt with deathrattle deal 3 to everything (if you had a dragon in your hand) and that was pretty good in some dragon decks. This isn't a dragon so it doesn't enable dragon synergy, but it doesn't need dragon synergy either. Seems like a decent aggro stopper though. comes kinda to late vs aggro. Primordial drake without tar creeper and tortolan would have not stoped aggro. A bit slow tough. I mean yeah it stops aggro but if you're not nearly dead by turn 7 against aggro you're winning either way. More like Abomination of the set, pun intended. There are worse cards. Some deck somewhere might want this. not necessarily bad, but boardclears that canbe silenced are rarely used. Could be interesting in Hunter with Nine Lives...but probably too late. This + Lightforged Blessing is a mega Spirit Lash. 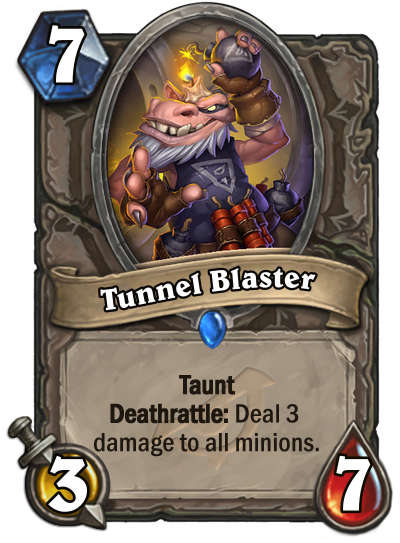 If there’s any aggro, this will see a lot of play in decks that have the ability to stabilise. Shame this came after Sunkeeper rotates out..... would be the perfect answer. Chillmaw reborn and it requires no condition to activate and it doesn't die to Dragonslayer. This will see play if Aggro is out of hand. Really like this card for Hunter decks running Nine Lives. 3 mana discover a taunt minion and deal 3 damage to the board is pretty strong. Hm... arguably better than Chillmaw, which was not played very often, then again times have changed... maybe not great, but one of the bettter taunt minions in Standard for the time being. This is a nice little clear board with Conjurer's Calling and you summon 2 7-cost minions on board.